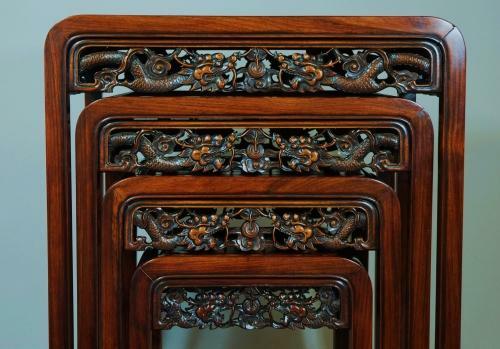 A late 19thc Chinese hardwood quartetto nest of occasional tables of fine quality & excellent condition. These tables are of good colour & fine quality, each having a finely carved & pierced frieze on each of the four sides, depicting dragons. The tops have a recessed panel which is inserted into a wooden frame, supported by the legs & then supported by shaped rails. On the underneath of each table top there is a department store label from the shop Jones & Higgins, Peckham, London. This store was Peckham's most prestigious shop & they opened a small shop in 1867 on the corner of Rye Lane (one of the most important shopping streets in South-East London) & Peckham High Street. This was one of the best known department stores in South London for many years & was open up until 1980. These tables are of sound construction & are in excellent condition.